As the weather gets cooler it can only mean one thing – cold and flu season is on its way. And while that’s not exactly what you want to think about when you’re planning a wedding, keeping your guests germ-free is a nice thought! Which brings me to today’s fun – and practical – wedding favor: personalized mini bottles of hand sanitizer. Think about it – you could have fun baskets full of these mini bottles set near the doors at the reception. Or pack them in care packages for out-of-town guests. Or just put them in baskets in the restroom at the reception venue. 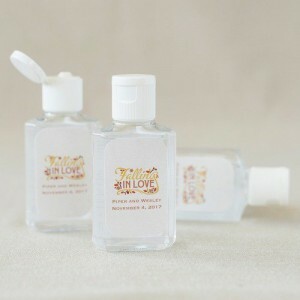 No matter how you distribute these little bottles of germ-free goodness your guests will appreciate the thought. And just to keep things pretty you can personalize the labels. You’ll find these hand sanitizers here.